SAFE: Only 8 inches in depth -allows for your small pet to safely enjoy this pool without having to worry about going under water! Size: Small Bet the Heat This Summer With The Front Pet Dog Pool! Does your dog love being outside? Frontpet wants to make those hot summer daysmore enjoyable for your dog! This is not your standard, plastic, off-the-shelf baby pool. This pool is madefor dogs. It's built to last. Have peace of mind knowing that the pool won't tear and leak, while you watchhim/her run and jump in and out of the water. The pool is 8" deep and 32" in diameter, so dogs can get completely saturatedand cooled while either sitting, standing or lying down. Take this pool withyou when you're on the go. When the pool is empty and dry, just fold and packit up. It's that simple. Setting the pool up and taking it down is quick and easy. To set the pool upsimply make sure the drain plug is closed and then place a running garden hoseinside the pool to the desired depth. When your canine friend is finished playing, or when the water becomes dirtyand the pool water needs to be changed, just release the drain plug and letthe water empty out. Note, If you do use the pool on a hard surface, it's bestto place a durable bottom material, such as a tarp, beneath it for addedprotection. 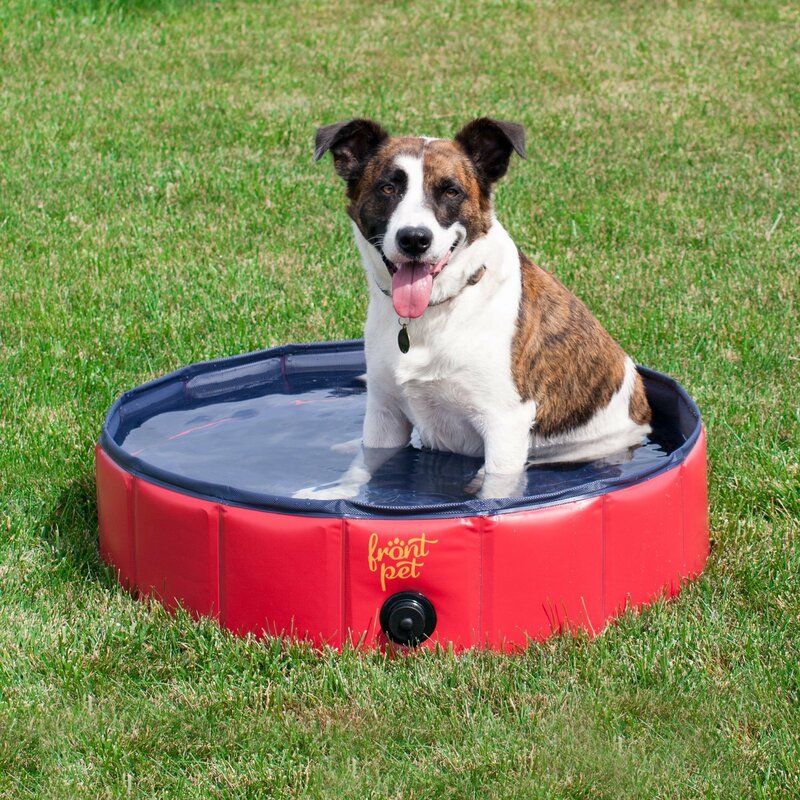 FrontPets Small Dog Pool Features: Dimensions: 8" deep and 32" in diameter so your dog can beat the heat nomatter their size! Attached drain plug that allows you to quickly empty your pool! Paneled segments that allows you to fold your pool for compact storage! Your pool is always ready to go because there is no inflation required!Simply unfold and fill! Durable bottom ensures your pool will not rip or puncture when your pet isenjoying the pool! Hit The Water & Order Yours Today!